White & Blue hostel offer you free WI-Fi. 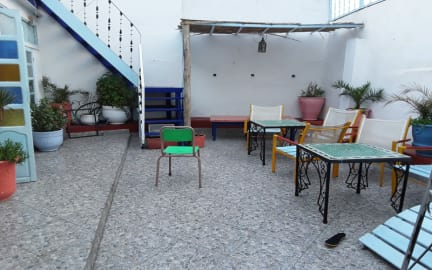 We also have cable TV, 24 hours security, Meeting Room , Our easy-going and friendly staff can help you enjoy any of the outdoor activities that Essaouira has to offer. Or if you prefer to just relax in and around the hostel - which is our home, too - we will treat you like family. 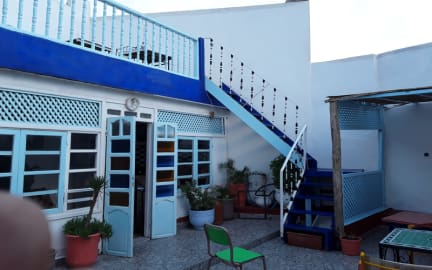 White & Blue hostel is located in Essaouira very near to Bab Marrakech - in the heart of the medina and just five minutes' walk from the beach. Essaouira Mogador Airport is 14 km away. You can easy visit the main Essaouira's attractions, as the souk, the historic city center, the Sidi Muhammad ben Abd Allah Museum. Each room here will provide you with a patio, a terrace and a seating area. There is a full kitchen with a coffee machine and a dining table. Very helpful, friendly, good-fun staff. We felt like family immediately and would always go back to this light, bright and homely hostal in the heart of the old town, near the bus station. White and Blue staff create a very inclusive and caring atmosphere. They were always giving above and beyond their job. This is not a party place but very social. The property is clean with lots of hot water. Meals are available by arrangement. Many cook with fresh vegetables and bread from the local marketplace. Most stay longer than planned due to open space, sunshine on the balcony as well as Moroccan culture. with interesting activities. This was a referral for me. I, too highly recommend. A real treat. The staff is genuine, friendly and helpful. Said et al are the best in the biz! Completely lovely staff and a great hostel to hang out on, we had a brilliant time. Our room smelled badly of damp, although certainly was clean. Comfy bed though and we probably would stay here again. Lovely and very helpful staff, great location, in the Medina but tucked away so it’s more secure and quiet. Very comfortable beds (pillows aren’t great) and good shower. Beautiful terrace where people spend most their time, and cute little kitchen. The staff always made tea for us, which was very kind of them. I would highly recommend this hostel. Overall a mediocre hostel where you can spend a few nights. There was no atmosphere and the staff were good but nothing stood out. Overall a clean average place to stay. Just after checking in some friends asked me to stay at a house they rented instead. Even a partial refund was not possible. I don't think I missed out by not sleeping there though, as the bed seemed very uncomfortable, the rooms weren't clean, and the toilet had no toilet paper and didn't flush correctly.